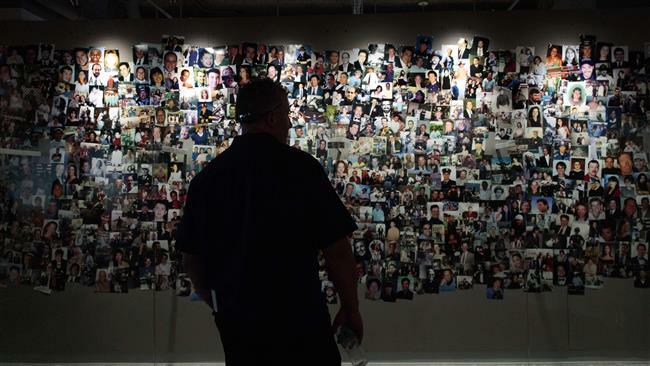 A man views photographs of victims in the new 9/11 Tribute Museum in New York City on June 13, 2017. New evidence in a lawsuit, which holds Saudi Arabia responsible for the September 11, 2001 attacks, shows that the kingdom may have funded a “dry run” prior to the incident. The lawsuit alleges that the Saudi embassy in Washington paid for two Saudi nationals, living undercover in the US as students, to fly from the city of Phoenix to Washington “in a dry run for the 9/11 attacks” two years before their occurrence, the New York Post reported on Saturday. Lawyers for the plaintiffs said the new details had painted “a pattern of both financial and operational support” for the 9/11 conspiracy provided by official Saudi sources. Citing FBI documents, the lawsuit said the Saudi students — Mohammed al-Qudhaeein and Hamdan al-Shalawi — were both members of “the kingdom’s network of agents in the US,” had received training at the camps run by the a-Qaeda militant group in Afghanistan, and were in “frequent contact” with Saudi officials while in the US. In a November 1999 America West flight to Washington, the Saudi students reportedly tried multiple times to gain access to the cockpit of the plane. Consequently, the pair were taken into custody following an emergency flight landing in Ohio, but later the FBI decided not to pursue prosecution. Some 3,000 people died in the 9/11 attacks, after four hijacked passenger planes were crashed into the World Trade Center in New York, the Pentagon and a Pennsylvania field. Fifteen of the 19 hijackers were from Saudi Arabia. In several cases, hundreds of victims’ relatives and injured survivors, along with insurance companies and businesses say, the Saudi government assisted the attacks through a variety of activities in support of al-Qaeda over a number of years. In September 2015, US District Judge George Daniels tossed Saudi Arabia out as a defendant. One year later, however, the US Congress passed legislation, known as the Justice Against Sponsors of Terrorism Act (JASTA), that eliminated some defenses and enabled the 9/11 victims to reassert their claims. Last month, Saudi Arabia asked a US judge to drop the cases against it, arguing that the plaintiffs had failed to generate sufficient evidence to subject the kingdom to the $100-billion lawsuits.